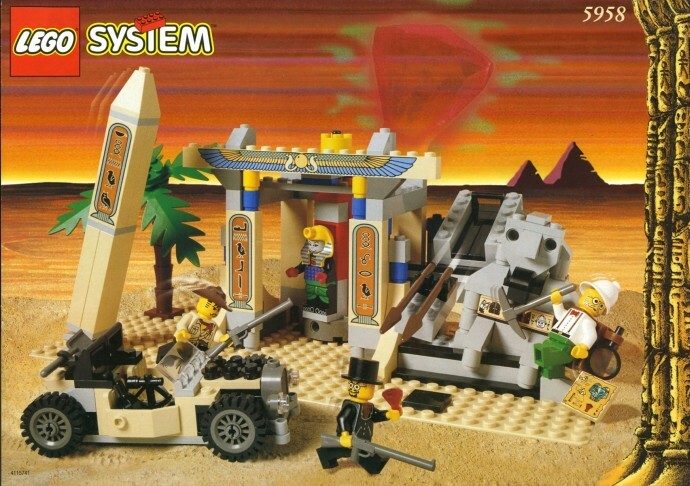 Today's random set is 5958 Mummy's Tomb, released in 1998. It's one of 21 Adventurers sets produced that year. It contains 260 pieces and 4 minifigs, and its retail price was US$30. It's owned by 1691 Brickset members. If you want to add it to your collection you might find it for sale at BrickLink or eBay. Great theme, and interesting parts and prints for it's time. 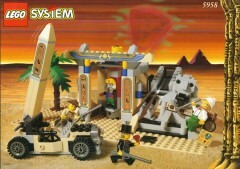 Mummy was the first light grey minifigure head, before Darth Vader in 1999.
seems kinda like an early pharaoh’s quest. Fun fact—I had this set before I knew how to pronounce "tomb". My parents thought me saying "Mummy's toe-mb" was hilarious. We miss you Johnny. Please come back for more adventures! This was just before my time, but I'm sure that the Adventurers theme would've been something I would've absolutely loved as a kid. Every time I see an Adventurers set, it still makes me smile a little bit. This set is so awesome... possibly the pinnacle of my childhood collection. It also made me form an unhealthy obsession for those little gems. I'll buy any set that has one. Ah, Adventurers, we hardly knew ye! Johnny and the gain were such a fun concept and roster of characters. They were willing to bring him back for The LEGO Movie so I think some sort of collector set for the whole team might be fun. I don't have any Adventurers sets, but I've got a decent amount of Pharaohs Quest and the two go great together! I always liked these 16x32 baseplate sets with the horizontal facade. This set shares a lot in common with sets like 6755 Sheriff's Lock-Up, 6267 Lagoon Lock-Up, and 6249 Pirates Ambush. Had a lot of fun with the prison cells and/or booby traps built on the ends. This theme was so fun. Great memories. The only set I owned from the original Adventurers theme was the largest, #5988-1, and strictly speaking it wasn't even mine, but my brother's. But most of the playtime was mine by a huuuuuge margin. I went on to collect all the mainstream sets (i.e. excluding polybags and other oddities) in the India and Mt. Everest subthemes of Orient Expedition. Because Johnny Thunder, duh. Before LEGO could land the rights to make Indiana Jones sets.. Actually these sets seem to age like a fine wine. When they first were out I barely paid attention, but they are really neat sets. the world is craving a comeback from Johnny Thunder, the time is right! I Still hope one day Johnny and his friends will return together in a brand new theme, hopefully lasting more then one wave, maybe with a tie-in TV series! I don't remember this one. Was it for sale in the UK? One of best examples proved no need for licence to produce fabulous theme/sets. I wasn't really into Lego anymore when this theme hit, but I still liked what it looked like. The Scooby Doo set 75900 - Mummy Museum Mystery reminds me of this one. I was about a year into my dark ages when this theme hit, so I don't have any fond memories of it. That said, I highly appreciate those cars that fit two minfigs side by side, which AFAIK was never done elsewhere. I hope they'll bring that back someday, somehow. Honestly, both the Egypt and Jungle adventurers wowed me when I was a kid. Still love them even now; they're right up amongst my favourite LEGO themes ever. The builds might be pretty basic, but the aesthetic more than makes up for that. Such a great theme which I sadly missed out on, being in the midst of my Dark Ages. I have Bricklinked several of those hieroglyph printed pieces though, can't wait to add them to a museum moc! Imagine the mummy awakening after thousands of years to find these people destroying and stealing his stuff. No wonder he isn't happy!